With a huge collection of sheet masks to use, some of them really delightfully obscure and amazing, it can be easy to forget about the less fancy varieties among them. I’ve still got quite a few masks left over from my first Innisfree mask haul that just haven’t been getting any of my attention lately. But I had some time today for an impromptu morning mask session, and the Innisfree It’s Real Squeeze Mask in Rose caught my eye. It’s very pretty and feminine, as you might expect. Lots of brands have rose-themed sheet masks. The My Beauty Diary Bulgarian Rose sheet mask is a popular option, and I’ve heard good things about Innisfree’s rose offering, too. 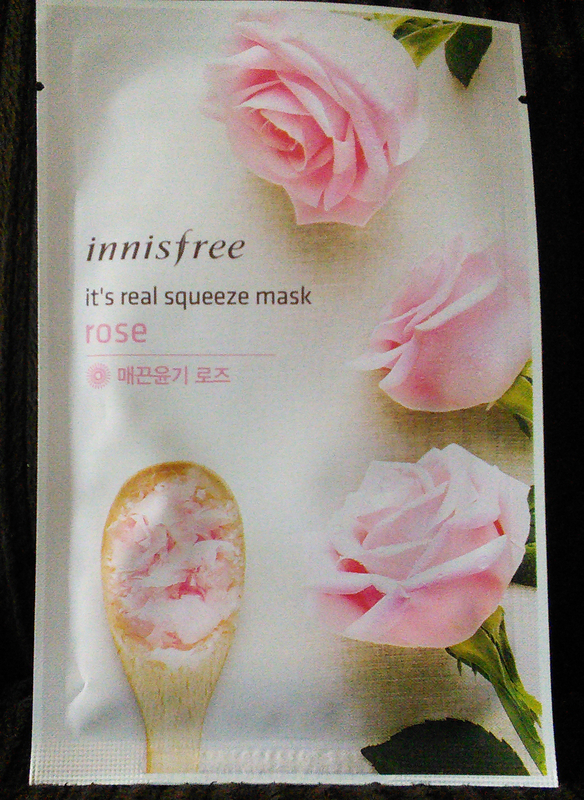 Purpose: Innisfree’s It’s Real Squeeze Mask in Rose claims to smooth and brighten skin. It “makes the skin smooth and glow,” according to the back of the mask packet. Do not use if: You are sensitive to alcohol, fragrance, botanical extracts, or anything else in the ingredients list. When and how to use: After cleansing and toning (or after all your serum/ampoule steps, the way I like to do), take mask out of the packet, unfold, and smooth over face. Wear for 10-20 minutes as directed or longer, being careful to remove the mask before it dries out on your skin. Pat in remaining essence and finish with a moisturizing lotion or cream. I like looking at the graphic representation of how the mask sheet moisture penetrates the skin. It makes me feel funny on my face. Notable ingredients: Lots and lots of botanical extracts here. Innisfree’s main distinction is the company’s focus on botanicals, especially those from South Korea’s Jeju Island. You’ll find the same cocktail of botanicals in the vast majority of Innisfree skincare products; that cocktail includes things like grapefruit extract, satsuma peel extract, and white and green tea leaf extracts as well. It’s an antioxidant-rich blend that theoretically elevates Innisfree sheet masks above the typical “water, glycerin, butylene glycol, bunch of fillers, a few humectants, star ingredient all the way at the end, fragrance” inexpensive sheet mask. Here, the star ingredient is rose juice, and it’s near the top of the list. Along with the other botanicals in the Innisfree rose mask, the rose juice contributes brightening, antioxidant, and anti-inflammatory powers to soften skin and restore radiance. Yeah, I’ve started Excel spreadsheets to keep track of botanical ingredients. Sue me. My CosDNA analysis of the Innisfree It’s Real Squeeze Mask in Rose came up nearly clean, with butylene glycol the sole ingredient singled out, getting a lowly 1 as a potential acne trigger. Butylene glycol is pretty much everywhere, so if you haven’t had an issue with it yet, I doubt you will with this mask. Do watch out for the alcohol and fragrance in this mask, however. I haven’t experienced any problems, but the more sensitive-skinned user should patch test a little of the essence in an inconspicuous place first. It’s been way too long since I’ve used an Innisfree sheet mask, and now I feel guilty. My 45 minutes with this mask (laid over a My Beauty Diary Puffiness Intensive eye mask to help hide the evidence of a string of late nights and a stolen Skinfood undereye concealer) were incredibly relaxing and an amazing way to restart my day after an unexpected early morning crisis. #doublefisting is the new sheet-mask-a-day. Despite a somewhat strong initial whiff of alcohol, which fades quickly, the mask essence here smells lovely. The rose scent is pretty and natural, in my opinion better by far than the fragrance in the My Beauty Diary Bulgarian Rose; it’s not strong at all, and it lingers, which in this case is a good thing. I laid back and breathed in the fragrance and could just feel my muscles loosening up and my mind clearing. This mask isn’t just good for the mind, either. After I took it off, I was very happy with the hydration and the brightening effect. While nowhere near as dramatic as some other masks provide, the brightening is noticeable and gives a nice boost of radiance. Finally, the very light, watery, non-sticky essence pats in and absorbs quickly and thoroughly, leaving no sticky residue to interfere with moisturizer, sunscreen, or makeup, making this mask ideal for morning use or before big events. My lotion, Biore UV Rich Watery Essence sunscreen, and Hera UV Mist cushion makeup went on like a dream. I go through phases. 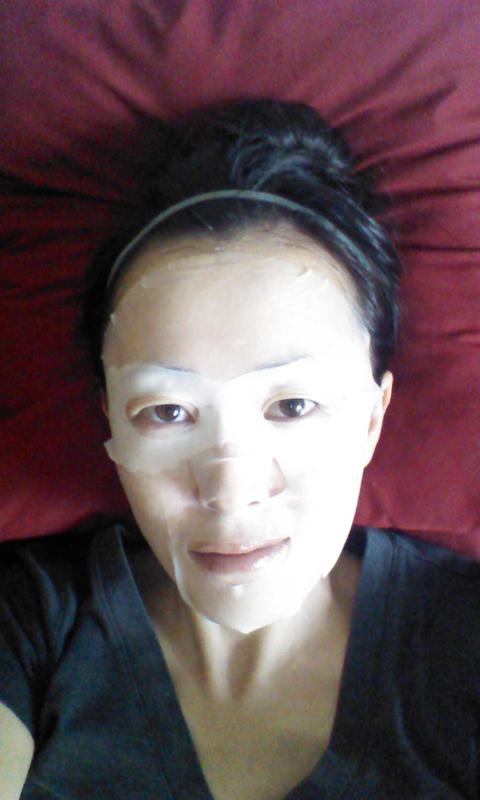 Sometimes I’m all about the simple sheet mask; sometimes I just have to have fancier hydrogels or ferment gels. Every phase I go through makes me temporarily forget the benefits of the mask type I’m forsaking. The Innisfree It’s Real Squeeze Mask in Rose reminded me, in the midst of a Hydrogel Masks with Lots of Cachet phase, that sometimes simple things can make for lovely experiences. Where can I buy Innisfree It’s Real Squeeze Mask in Rose? 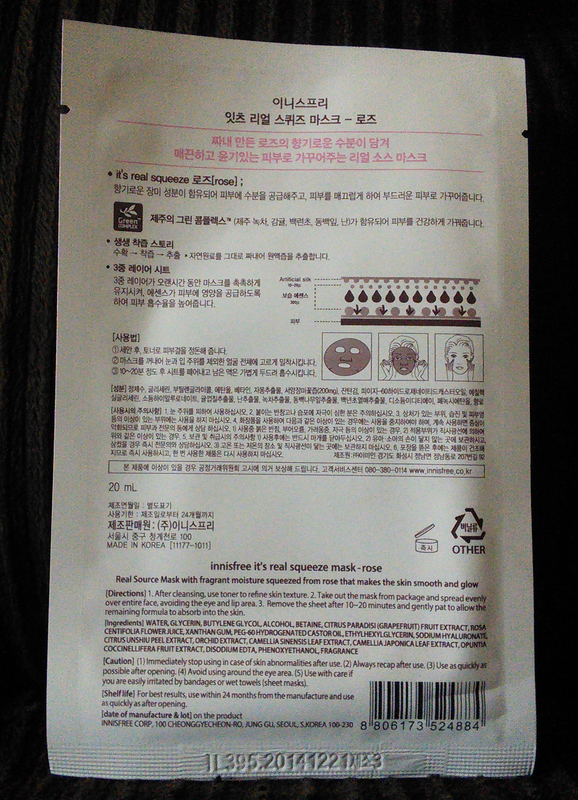 On sale for 2,280 won (currently about $2.09) for three masks on RoseRoseShop–about $0.70 apiece! What’s your favorite rose mask? It is distressing how many masks have alcohol in them, but I’ve personally found it to be fine for those who do not have dry/dehydrated skin or an alcohol sensitivity. I am quite interested to try more masks that don’t have alcohol, though. Thanks for the review! I was on the fence about trying anything rose-scented since I feel like the rose smell can easily be overpowering and gross, but it’s great to see that not only is it subtle and not overpowering but it also works really well. I’ll definitely throw this into my next sheet mask haul. do i wash my face when im done or do i just leave the remaining essence on my face? Just leave it on, no need to wash. Many people (like myself) also like to seal in the hydration by using an oil, cream, and/or sleeping pack afterwards. I just tried this mask out a week ago, and I left it on my face for around half an hour. Maybe because the weather at that time was really hot and humid, but the mask left my skin really sticky and oily (I have oily, acne-prone skin btw). I waited for about an hour, but it just wouldn’t dry out. And it left my skin even duller than before I put it on (but I think that was just because of the stickiness/oiliness). I had to wash it off with water after a while, and the next day, I didn’t really notice a difference. So I was wondering, are the Innisfree masks suited for hot, humid weather? And is nighttime the best time to put on masks? Or are these masks just not suited for my skin type? Thanks for the review!